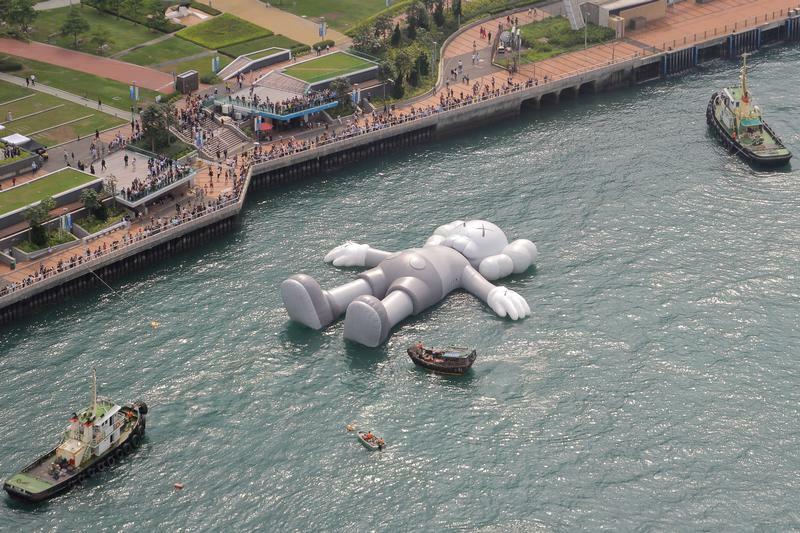 A giant "Companion" inflatable sculpture by U.S. artist Brian Donnelly, known professionally as Kaws, is seen displayed at the Victoria Harbour in Hong Kong, China March 22, 2019. Art Basel, an annual art fair, begins in Hong Kong on March 29. The seventh edition of this event will feature 242 leading international and local galleries. The global art market grew by 6 percent to just over $67 billion, according to a report by Art Basel and UBS released on March 8. The top three markets - the United States, the UK, and Greater China - accounted for 84 percent of total sales in 2018. But China’s share of the global art market slipped to 19 percent from 21 percent, taking it to third place. Art sales in Greater China, which includes Hong Kong, Macau and Taiwan, fell 3 percent to $12.9 billion in 2018, the study found. Auction sales declined by 9 percent to $8.5 billion. It also had a high rate of so-called buy-ins, or failed sales: 57 percent of the lots offered on the auction market did not find buyers.